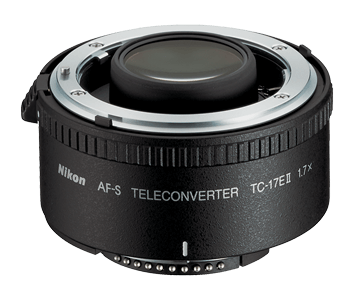 Nikon AF-S Teleconverter TC-17E II is a precision optical accessory, mounted between the camera body and lens. The TC-17E II provides a 1.7x increase in the prime lens&apos; effective focal length with a one and half f/stop loss in effective aperture. Because your AF-S Teleconverter has CPU contacts, you can take advantage of features such as metering system, exposure mode, etc.